Barcelona Top Ten Attractions and Top Things to see in Barcelona 2019. Thank you for visiting our popular guide to Barcelona's Top Ten Tourist sights and welcome to Barcelona. This is our personal collection of 10 best sights and things to do in Barcelona with tips for 'must-see' attractions. Scroll down the page for a Top 10 map. Follow the blue links for pictures, maps, addresses, visitor tips and also tour recommendations. You might also like our guide to how to plan 3 days in Barcelona, our Barcelona hotel guide where to stay in Barcelona. Number 1. ;La Sagrada Familia temple. At the top of any list of Barcelona Top Ten Tourist Attractions you will always find the fabulous and still unfinished church of La Sagrada Familia which was designed by Antoni Gaudi in 1882. This unique and breathtaking construction is Barcelona's most famous tourist attraction and the most visited attraction in Spain. It is like no other cathedral in the world and is rated as one of the world's top attractions by Tripadvisor users worldwide. 3 million visitors a year means there are often long lines to visit the spectacular interior, (plan on 1-2 hours to see inside) and we recommend you pre-buy skip-the-line tickets especially in peak vacation times. History of Sagrada Familia. The foundation stone was laid in the year 1882. At that time the land around the basilica was mostly fields. This temple was designed by famous Catalan/Spanish architecht Antoni Gaudi. It will be finished in 2026. The interior opened in 2012. The natural light through the windows in the morning and afternoon is stunning. The exterior is still under construction and currently at around 75% completion with only 8 of the planned 18 spires completed. The goal is to complete the Sagrada familia in the year 2026 to mark the 100th anniversary of Gaudi's death in 1926. This will be 144 years after building was started. Gaudi died tragically in 1926 after being hit by a tram. At the time of Gaudi's death only the nativity facade being built. Gaudi knew that he would not live to finish the temple and once famously said, 'My client is not in a hurry' by this he was referring to God as his client. Watch a YouTube video to see how the finished Sagrada Familia will look. To visit the Sagrada familia you can take a hop-on-hop-off bus - or take the metro to station Sagrada Familia. See map. How long does it take to visit Sagrada Familia? From the outside only 15 to 30 minutes to walk all around which is free. To visit inside the Sagrada Familia church plan on 1 to 2 hours inside depending on which ticket you buy. Open all year, but closed for some services and special religious events. Open 9 am to 6 pm. Open 9 am to 7 pm. Open 9 am to 8 pm. Open 9 am to 2 pm. Number 2. The Font Mágica Fountain. The Magic Fountain is a 'must see' Barcelona attraction. You have never seen a fountain like this. It really does feel magic to experience the beautiful show of water, light and music. The Magic fountain was built in 1929 as one of the main attractions for the 1929 Barcelona World Fair and the Font Magica is still one of the most famous places in Barcelona with an estimated 2.5 million visitors annually. In the winter the fountain only has evening water and light shows on Friday and Saturdays. In the summer the evening light and music show are from Thursday to Sunday. Admission is free all year. See show times below. Please note that sometimes due to exhibitions and events access to the fountain can be closed. Visit the Magic Fountain by metro to station Espanya or bus 55. See map. Number 3. Picasso Musuem. In the Born area. The Picasso Museum is Barcelona's most famous museum. Pablo Picasso was born in Malaga in the south of Spain, but the Picasso family moved to Barcelona in 1895 and Picasso lived here until 1904. Picasso's father was an art teacher and although as a child Pablo Picasso already studied art in Malaga, it was in Barcelona that he spent his formative years. Picasso considered himself as being from Barcelona and it was here that spent his early years as a struggling young painter and first exhibited. The most famous Picasso paintings are not in Barcelona, but you can see a unique collection of 4000 works with early sketches and canvases, which shows his incredible development from student to the world´s best loved artist. The museum is in several magnificent gothic mansions in the Born part of Barcelona's old city. Visitor Tip 1: Book a Picasso walking tour which includes skip-the-line access and guided tour. Visitor Tip 2: Buy skip-the-line Picasso museum tickets. Visitor Tip 3: The Picasso museum has free admission for everyone on first Sunday of month all day and free every Thursday after 6pm. TICKETS Picasso walking tour incl museum skip-the-line tickets. Number 4. La Rambla street. Also called Las Ramblas because it consists of diffferent sections. The Spanish poet Federico García Lorca said 'It is the only street in the world which I wish would never end' and it almost doesn't because it now continues into Port Vell marina. La Rambla starts at central square Plaza Catalunya and ends at the Columbus monument at the Port Vell marina. La Rambla it is not a spectacular attraction in any way, but very pleasant to stroll down and feel the human heartbeat of Barcelona. La Rambla is also called Las Ramblas because different stretches of the street have different names. La Rambla is safe to visit, however, be careful of pickpockets on La Rambla and in nearby Metro stations. In the early hours of the morning from 2 - 4am be wary on the lower part of La Rambla near the harbour. See map. Visitor Tip: Watch out for pickpockets when you watch street art performances. Number 5. Camp Nou stadium. Home of Barcelona football team. Buy Official Tickets Barcelona games at Camp Nou. If there are no games during your visit, then book tickets for the stadium and museum called the Camp Nou Experience. The Camp Nou stadium and FCB museum are among the most popular attractions in Barcelona attracting millions of visitors a year. Camp Nou also has the one of the largest Nike stores in Europe packed with Barca merchandise. Unmissable for Barça fans. Visitor tip. You can buy cheaper FCB shirts and scarves from market stalls outside stadium on match days but they might not be official. Number 6. The Barrio Gotico. The gothic quarter is the medieval city of Barcelona. It grew around the ancient Roman town of Barcino which is Barcelona's oldest area. The gothic part of the city has many beautiful churches, plazas, markets and museums and you can see parts of the old Roman walls. If you visit the Barcelona history musuem Museu d'Història de la Ciutat you can see remains of Roman Barcino houses and streets under the museum. The gothic quarter is free to visit and best seen on foot because tour buses cannot drive through the narrow streets. There are no dangerous areas in the Gothic quarter, but be aware of Barcelona pickpockets. Also worth visiting is the neighbouring medieval areas of Barcelona's old city called El Born, Barceloneta and Raval. Number 7. Parc Guell. Parc Guell i is a UNESCO World Heritage Site and is considered to one of Gaudi's most artistic works. Parc Guell is a Barcelona top attraction and must-see. The park is on Carmel hill so seeing this attraction involves a 900m uphill walk if you take the hop-on-hop-off bus or arrive from metro station Vallcarca. If you prefer not to walk, then take a taxi to the Park Guell front gate. The original idea of by Josep Guell was to develop a private and exclusive residential garden village with 60 houses. It didn't work and after Guell's death in 1923 the park was donated by the Guell family to Barcelona as a public park. Number 8. Modernist buildings. Modernisme was a Catalan cultural movement centred in Barcelona and Catalonia from 1888 to 1911. It is most famous for its architectural expression in particular the many works of Antoni Gaudí. There are a handful of modernist buildings in Barcelona that are unique and three of them are in the same Barcelona city block facing street Passeig de Gracia. The block is nicknamed 'Illa de la Discòrdia' - the 'Block of Discord' because the buildins are so different. They are Casa Amatller designed by Josep Puig i Cadafalch, the magical Casa Batlló by Antoni Gaudi and the Casa Lleó-Morera. A little further up the street Passeig de Gracia is one of Gaudi's most famous buildings - Casa Mila - nicknamed "La Pedrera" (the Quarry) because of its design. In the summer months you can enjoy rooftop terrace concerts at La Pedrera. Casa Batllo offer summer concerts in their modernist courtyard. Another modernist treasure is the beautiful Palau Guell town house near Las Ramblas, also by Gaudi. For modernist art and furniture visit Barcelona's Modernist museum. Number 9. Montjuic hill and Poble Espanyol Spanish Village. Montjuic hill has many parks and attractions. There is a former fort on the summit called Montjuic Castle, which has a rich and dark history and fantastic views of Barcelona. The other main attraction on Montjuic hill is the Spanish village Poble Espanyol, which is a festive celebrations of Spanish and Spanish culture and architecture. Originally built for the Barcelona 1929 World Fair it is showcase village of Spain's different regional styles. You can see all of Spain in one village. It was so popular with visitors and locals alike that the city kept it after the world exhibition ended. It now houses a wide variety of cafés, night clubs, restaurants, over 40 artisan craft shops and the popular El Tablao de Carmen flamenco show. In 2018 Poble Espanyol opened a new "Fiesta" space which is an amazing multimedia show highlighting Spain's most popular anf famous cultural festivals, celebrations and landscapes. Visitor tip. The flamenco show includes 1 hours free entrance to Poble Espanyol. See map. This attraction is on hop-on-hop-off bus routes or take metro L1 or L3 to nearest metro station Espanya and then it is a 20 minute walk to Poble Espanyol. Number 10. Tibidabo. A visit to Tibadabo is a fun thing to do in Barcelona and great for kids. The views of Barcelona are fantastic and there is a small and fun vintage amusement park at the top, which is open in the summer from March to September. You can reach the Tibadabo hilltop by a vintage Blue Tram which connects to a mountain railway. Or take a bus from the Plaza Catalunya directly to Tibidabo when the funfair is open. The fun-fair is closed in winter, It is open at weekends in spring and autumn and generally open from Wednesday to Sunday in summer, but check before visiting. The Skywalk to enjoy views of Barcelona is free and open all year except a few weeks in February for annual maintenance. The Sagrat Cor church on Tibidabo hill is open all day all year and is free to visit. Top attractions near Barcelona that can be visited in one day or half a day. Open all year. Free to visit. 1 hour from Barcelona. 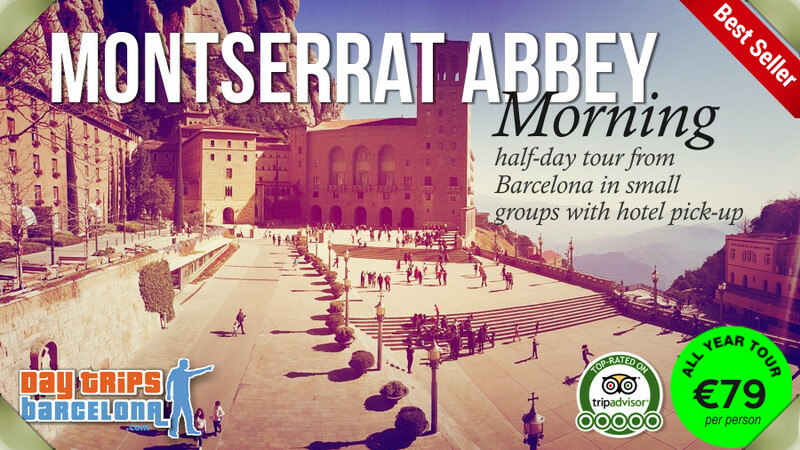 Montserrat mountains, monastery and basilica is one of Barcelona and Spain's biggest tourist attractions. You can see and touch the famous 12th century Black Virgin of Montserrat, enjoy breathtaking scenery of amazing rock formations and panoramic views. Montserrat mountain is just one hour from Barcelona and is visited by 3 million travellers and pilgrims every year making it a tour attractions outside Barcelona. Girona is a historic jewel just over an hour north of Barcelona by tour, bus or train. It's a city full of legend and beauty and recently also became a location for new episodes of TV show 'Games of Thrones'. Girona is famous for its colourful hanging houses over the River Onyar, for the well preserved medieval Jewish quarter and the historic walled Old Quarter (Barri Vell) that dates back to Roman times.